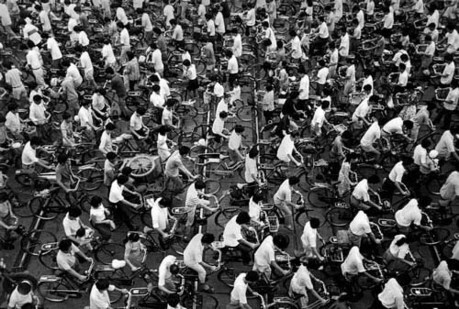 ecocity | publicity | mobility: China: The (lost) Kingdom Of Bicycles? According to Wang Fuchang, the Chinese director of the Department of Equipment Industry under the Ministry of Industry and Information Technology, "it is estimated that automobile ownership in China will exceed 200 million in 2020, causing serious energy security and environmental issues." Currently, there is a year on year increase of approximately 30% in private car numbers. The Star reports that while morning rush hour in Beijing and Shanghai used to be rivers of cyclists flowing in a majestic hush down broad bike lanes, today, many of those lanes have been taken over by cars and buses. Yet despite China's leap into modernity, the bicycle is far from dead, in fact it's numbers are growing. For many Chinese, pedal power remains a mainstay for commuting, sending children to school or making a living. And getting around the traffic jams. As the Chinese fall in love with cars, and Westerners fall out of love with them, China is once again a winner. According to the Earth Policy Institute, a Washington-based environmental think tank, of the 130 million bikes manufactured worldwide last year, China made 90 million, and exported two-thirds of them. About nine in 10 bikes bought by Americans are made in China.